Member of Kirtland AFB Precision Drill Team, 1953-55. A military brat that is who I am. My father, as well as my maternal grandfather, were both in the Philippine Scouts, an organization of the US Army in the Philippines. Born and raised in a military environment, disciplined and orderly. A lifestyle that was ingrained in my persona, one that suited me well. At Clark Air Base (formerly Fort Stotsemburg), where my father was stationed, military dependents like myself were referred to as "Army Soup". 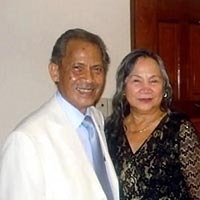 When World War II broke out, my father was a Gunnery Sergeant with the 88th Field Artillery, 2nd Battalion, Battery E. After engaging the enemy in four months, the U.S. and Philippine defenders surrendered to the Japanese Imperial Army in April 1942. Thus commenced the infamous "Bataan Death March". Father survived the march, imprisoned at Camp O'Donnell, Capas, Tarlac. He was made a prisoner of war from April 9, 1942, to 31 August 1942, an influential factor in my decision to join the service. For his service, my father was awarded the Prisoner of War Medal and the Congressional Gold Medal. 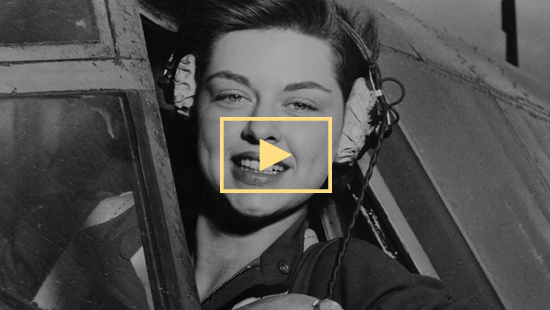 When I enlisted in the Air Force, I was still a non-citizen. As a result, I was sent on a Directed Duty Assignment to the 4900th Supply Squadron in Kirtland AFB, New Mexico. Although spending most of my career in supply as well as logistics, I did Instructor, First Sergeant, Inspector General IG), and finally culminated as Senior Enlisted Advisor to the Wing Commander at Beale AFB. It was an enjoyable career and experience for myself as well as my family for 28 years. 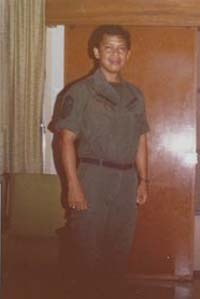 1965-67 As a Non-Commissioned-Officer In Charge of the Mobile Spares Kit Division (WRM) at Clark Air Base. Provided logistical support to F-102 and B-57 Rotational Squadrons from Clark Air Base deployed in Ton Son Nhut, Cam Ron Bay, Nha Trang, and Danang. During TDY in Vietnam, riding shotgun in delivering aircraft spares to various points. Was also instrumental in providing War Readiness Transportable Kits for the F4's and F106 deployed in Ubon and Tachi in Thailand. 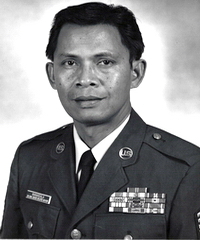 1970-71 As Superintendent of Supply and Services Branch, Directorate of Logistics, Deputy Chief of Staff/Communications-Electronics, Headquarters Seventh Air Force/1964 Communications Group, Ton Son Nhut Airfield, Republic of Vietnam. Provided TACAN, spare parts for all communication equipment in Ton Son Nhut, Bien Hoa, Nha Trang, Cam Ron Bay, and Danang. Worked and collaborated with the Vietnamese Air Force (VNAF). In the performance of my duties, I was required to conduct inspections of our satellite units traveling by helicopters or C130's, which were subject to ground fire. 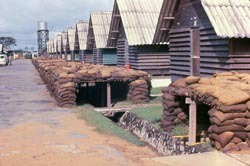 Our base camp at Ton Son Nhut was always subject to mortar attacks by nights. Performing while engaging in ground operation against an opposing armed force is definitely a life-changing experience. In 1965, I got an assignment with Southeast Communication Region at Clark Air Base in the Philippines. I left Travis AFB as the NCOIC of the War Readiness Material Division. It just so happened that the WRM Division in the 6200th Supply Squadron was having a supervisorial problem, especially in their support to Southeast Asia. The Base Supply Officer found out about my experience, went about the Major Air Commands, PACAF and Air Force Communications Command to transfer me to 6200th Supply Squadron. Sometime during the year, Lt. General James W. Wilson, (known as Whip Wilson), Commander 13th Air Force drove his black staff car into my WRM warehouse. He asked me if we have supplies stored in outside storage, and if so to move it inside the warehouse discounting warehouse clearance procedure. That evening without consulting anyone, we moved all our supplies from outside storage to inside the warehouse stacked up all the way to the ceiling. The following morning he was back, drove his staff car all the way to the end of the warehouse. Before he left, he told me everything looks good. On our next meeting, the Base Supply Officer informed me that he had received a card item on TSgt Agapito M Manansala from General Wilson. He wanted to know why a Filipino-American is in-charge of the most classified material in Base Supply. I never knew what the reply was. The next thing the Wing Senior Enlisted Advisor brought me a pair of Master Sergeant stripes from the Command. Definitely, my being chosen as the Senior Enlisted Advisor to the Wing Commander at Beale AFB, California. Most of my assignments were focused on improving the supply as well as the logistic systems to ensure timely support to assigned aircraft. The last four were dedicated to raising the morale and welfare of the workforce to include civilian employees. I consider it a privilege and a blessing when I am able to provide assistance, solve problems, as well as helping elevate Airmen/Airwomen in their careers. Fortunately, all my assignments have proven to be productive, thereby enjoyable, or made them enjoyable at any rate. Group picture of the 15th AF Senior Enlisted Advisors in front of an SR71 Blackbird at Beale AFB, CA. My tour of duty in Ton Son Nhut Airfield, Republic of Vietnam. 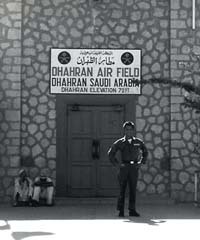 In another section, I mentioned that in 1965-67, I was stationed at Clark Air Base and in charge of the WRM Division. My division was providing supply support to two Rotational squadrons, The F-102, and B-57 in Vietnam. Personnel that worked for me love volunteering to go Temporary (TDY) to where our WRM Kits were deployed, at Ben Hoa, Nha Trang, Cam Ron Bay, and Danang, usually for one to two weeks. The incentive was tax-free on one's pay for the period in the country. But more importantly, the feeling of having been in a war zone was an overriding factor, especially for the younger Airmen. By the way, I was no exception. Now back to my tour in Vietnam. Now, this was no one or two weeks TDY. This time it was for the entire course. Soon as you arrive, you have issued a helmet and a flak jacket. Daytimes were mostly okay. Night times were a bit worrisome due to some rocket attack by the Viet Cong. Seemed like everybody had a "Calendar", keeping track of their return date to the land of big BX. 1. Bronze Star - For performance, while engaged in ground operations against an opposing Armed Force. (Ton Son Nhut Airfield, Republic of Vietnam). 2. Meritorious Service Medal SECOND OAK LEAF CLUSTERS - For dynamic and humanitarian leadership in these critical positions resulted in major contributions to the effectiveness of the Strategic Air Command mission and to the increased morale and welfare of the Beale Air Force Base community. (Position...Senior Enlisted Advisor to the Wing Commander, 100th air Refueling Wing). 3. 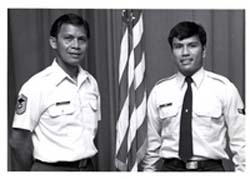 Air Force Commendation Medal FIFTH OAK LEAF CLUSTERS - Chief Manansala's meritorious service contributed immeasurably in increasing the combat readiness of the 7th Bombardment Wing and 301st Tactical Fighter Wing at Carswell AFB, Fort Worth, Texas. 4. Outstanding NCO of the year 1960 - Air Materiel Force, Pacific Area. 5. 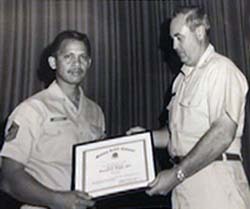 Outstanding NCO of the year 1968 - Military Airlift Command. 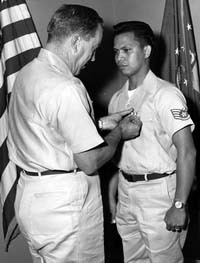 In the picture, Colonel Theodore J. O'Connor presenting the Award to Senior Master Sergeant Agapito M. Manansala at Norton AFB, California. The first Air Force Commendation Medal I received in 1962 was definitely the most meaningful. For it opened new opportunities/challenges, as well as paved the way for all my succeeding awards and decorations. It turned me from a worker bee into an innovator, seeking and welcoming all challenges in my career path. The Bronze Star for it was awarded for services performed while engaged in ground operations against an opposing armed force. 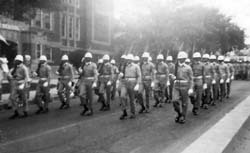 When we joined the service, we took an oath to put our lives on the line if necessary. This medal is a testament that I honor and fulfilled that oath. ***PICTURE Receiving Medal- Staff Sergeant Agapito M. Manansala, 1501st Supply Squadron is presented with the Air Force Commendation Award by Colonel Edwin A. Bland Jr., Base Commander, Travis Air Force Base. The Sergeant received the award for his outstanding service while serving at Tachikawa Air Base, Japan. The picture appeared in the Travis AFB Newspaper, the Global Ranger. Vera A. Dressel, GS-11, Chief, Logistical Support Branch, Military Assistance Program. She recommended me for the Air Force Commendation Medal at the early stage of my career. Her action opened up all kinds of opportunities and challenges prompting me to do better and better on each of my succeeding assignments. Results: Bronze Star, Meritorious Service with two oak leaf clusters, AF Commendation Medal with five oak leaf clusters...not to mention the accompanying promotions. Chief Master Sergeant Ernie Cano. Ernie, was an Administrative (702) Technician when he arrived at Beale AFB as my Admin. in 19 78. I was at that time the Sr. Enlisted Advisor for the 100th AREFW. In the picture, Ernie is with me as my Chief Clerk. Msgt Hilliard Jenkins, a supply Manager. He and I attended a Tech School in Denver, Colorado on managing communications spares and spare parts prior to going to our assignments to Vietnam. We wound up working together at the 1964 Communications Group. Have been in touch with him this year. Currently living in Alabama. While at Ton Son Nhut, I resided in the Chiefs Dormitory with a roommate, who worked at the base operation. One evening while taking a shower, the base siren sounded a probable mortar attack by the Vietcong. Following instructions, I went back to my room, put on my flak jacket, and scooted under my bed waiting for the all clear signal. Time passed by, the door to our room opened with my roommate asking me what I was doing under my bed when the all-clear signal was blown 15 minutes ago. Folks my face was red. 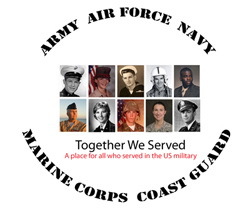 I did recruit work for a company, Search and Recruit based in Virginia and owned by a retired Navy officer. We placed detaching military personnel with technical experience with client companies, who paid for our services. Have been and still doing community work. 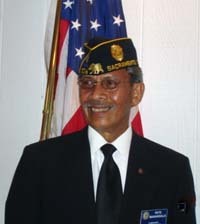 Have been a Commander of American Legion 604 at Gerber Road, Sacramento, CA. Also have been a member of VFW 4647 in North Highland, CA. Some benefits in insurance and usage of building facility. Have become somewhat regimented, flexible as well as open-minded. Using all possible options in decision making and collaborating whenever possible. Like it's the civilian counterpart, military life have its ups and downs. Learning how to navigate to overcome obstacles by always dressing immaculately, respectful, friendly, as well as helpful to everyone. Moving and reassignments caused temporary disruptions in both social life and children's education. On the plus side...meeting new challenges, associates as well as new friends. Exposure to a new environment and culture generated open-mindedness, tolerance, as well as understanding...education that can be obtained only through actual experience. 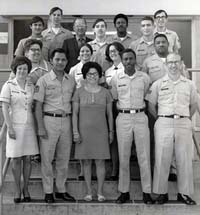 Picture as the Superintendent of the Special Support Section for the C-141 Primary Supply Points for the entire Pacific Area. Know your job well, work hard, be an authority about your job if you can, as well as find out if it can be improved. Pleasant attitude is a strong asset, a must. Learning is a continuous process, so go study it will help in your development. Find out the do's and don'ts. Find time to do community service, and volunteer to give your career a head start, and the rest will follow. Here I volunteered and joined the Kirtland AFB Precision Drill Team to give my career a good head start. I am the first Airman leading the first squad. After many moons, forgetfulness at times prevails. By asking relevant questions. TogetherWeServed.com has been helpful in coaching one in remembering things past. On several occasions, it was necessary to review documents and files to ensure the veracity of entries.